My grandma is also the epitome of love. She has sacrificed so much for her family and up to us, her grandkids and I very well know that is born out her pure heart that is full of love. I get emotional Everytime I think of her. But whenever I get to talk to her or videocall her (she’s been living in the States for decades now), she’s pretty talkative and has a lot of views regarding just about anything. I take after her so much. Before I start to cry over here and not being able to finish this post, in line with what I just related a few moments ago, let me tell you about this new restaurant Mama Au’s in the newly-built mall in Marikina Heights, Ayala Malls Marikina. It is a sister company of Antonio J’s which serves American-Italian comfort food with Filipino touch. This restaurant is the ode to the patriarch of the family who owns the business. Here her heirloom dishes born out of love for cooking and love for her family are recreated by Mama Au’s grandson and family. Chicken Pesto Pasta - served with grilled chicken and Mama Au's special pesto. Most pesto pasta that I’ve tried is a bit oily. This one was not, which made the flavor of the pesto more defined and I liked it. Four Cheese Hawaiian - handmade flat bread topped with mozzarella, cheddar, quick melt cheese, Parmesan, ham and pineapple. I actually didn’t get to taste the pineapple on here but still I liked it because I was able to spread the cream cheese on the flatbread, fold it and eat it like a quesadilla. Truffle Mushroom and Cheese - Mama Au's specialty Flat Bread topped with shiitake mushroom, cheese, truffle oil and chimichurri. I love this variant of their flatbread as I love mushrooms. The aroma was inviting and the truffle flavor was apparent. Mama’s Signature Fried Chicken - with buttermilk gravy. Comes in 2 pieces with plain rice or 5 pieces with 2 rice and 1 side dish. I love their fried chicken; they tasted old school or classic and the skin was crispy. The gravy that came with it was good too as this was homemade. Top Blade Steak - 225g USDA steak with mixed vegetables and mash potato. I like my steak medium rare and it was good that this was cooked just how I like it. It was tender and already tasty even without the sauce that it came with. The mashed potato was smooth, milky and creamy. Mama's Calamari - squid rings mated in light and crisp starch served with aioli sauce. The calamari pieces were easy to eat because they weren’t tough unlike other squids cooked in this manner. I like how the aioli sauce that it came with as well. Mama's Heirloom Hickory Ribs - can be ordered two ways: Signature Slab (1 slab, java rice and coleslaw) and Big Slab (2 slabs wit 3 side dishes). One of the Western food that has a special place in my heart are hickory ribs that’s why I have nothing but gladness eating this offering from Mama Au’s. Its taste is classic and the meat was tender and succulent. Oreo Cheesecake - this smooth, creamy, cookies and cream filled cheesecake. A perfect ending to this heart-warming late lunch. Java Rice and Herb Butter Rice - two of Mama Au’s flavored rice that went well with the other dishes that were served to us. 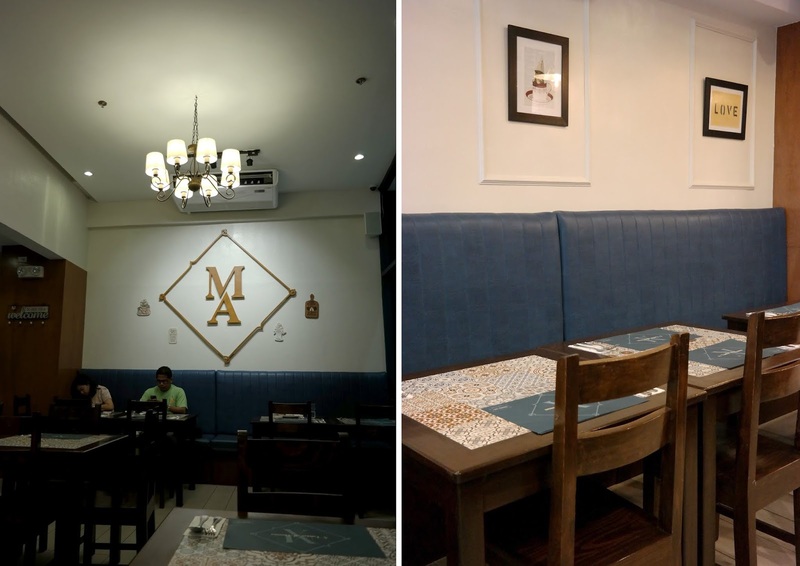 If you’re longing for grandmother’s or mom’s good old fashioned cooking, then Mama Au’s is perfect for you. They have more menu items to try besides the ones featured here, so visit them soon. It’s truly a perfect place to get your fix of Western comfort dishes.